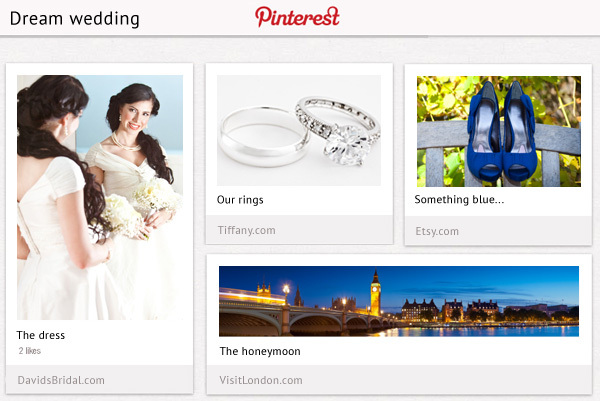 I recently read an article about the seemingly widespread practice of creating wedding-related Pinterest boards before a wedding is planned, an engagement proposed, or a partner even identified (http://www.fsunews.com/article/20130801/FSVIEW0101/130731021/Girls-get-Pinterested-wedding-wishlists). I’ve seen some of this impulse toward “When I…” boards on the social media site. Sometimes the speculation is “When I have a baby,” or “buy a home,” and so naturally “get married” fits as the kind of category for which one might plan. But for some reason, the wedding seems a more problematic hypothetical, and I do think the process for planning without any sort of end date in mind (or end mate, for that matter [sorry]) contributes to that. When people critique American wedding culture, this is what they’re looking at. Too many women – and the suggestion is that this is primarily a female phenomenon – focus more on what they want their wedding to look like than on what they want their partner or their marriage to be like. What’s more, they don’t care what that partner might desire for his/her wedding day. The bride’s day will be the bride’s day. As a whole, these “when I” boards give me pause, but I worried that I might be too knee-jerk in my critique. Trying to think about the process of “pinning” a dream wedding in a historical context, I wondered if this is in some way the 21st century equivalent of the hope chest. 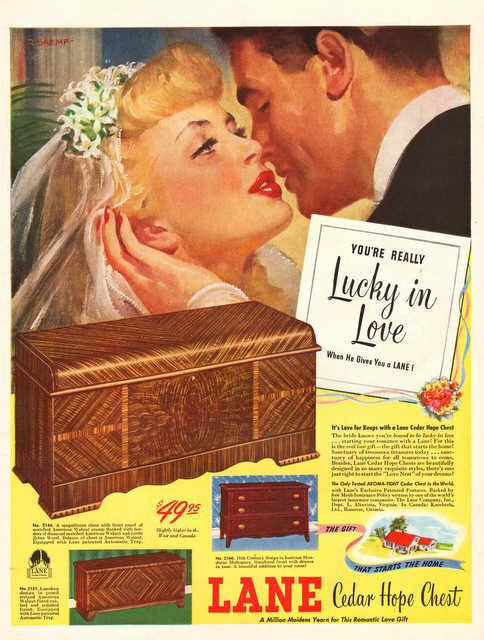 During the 19th century and well through post-World War II period, many young women collected goods for marriage in such chests. From girlhood, a woman stockpiled linens, towels, flatware, and various other domestic goods for her future home. Year-by-year, she added things to her collection. The expectation was that she would one day marry and thus would need to be prepared. For most women, that expectation was right on. Unless well-educated or raised in material privilege, the best means of support for a woman was to be found through a union with a man. And of course social and cultural expectations pointed directly to marriage, home, and family life as the culmination of success for American women. Ultimately, though, I have to conclude that preparing for a home – and particularly in the historical context – was a different thing than preparing for a wedding. The circumstances under which young women filled their hope chests veered far more toward the practical than the aesthetic (and, in fact, the emerging domestic aesthetic that tended toward the trendy or the store-bought – a particularly popular look in the newly developing postwar suburbs – helped make the keeping of a hope chest an increasingly outdated process from the 1950s on). In a time when brides and grooms couldn’t depend on a string of showers or the presentation of elaborate wedding gifts – or cash, as many prefer now – to mark the start of their union, they had to take responsibility for material and financial support during the early years of marriage before they entered into that relationship. For men, that often meant securing steady employment and the start of a nest egg. For women, that meant preparation of the necessities required of a home (and often steady employment and nest egg contribution until at least the birth of the first child, if not beyond). In my research, I’ve read about many women who dreamed about their weddings since childhood. And clearly this is a popular trope in contemporary wedding culture. In one personal essay I read, a woman admitted to keeping a wedding binder during her 1980s girlhood, in which she included advertisements and articles from bridal magazines, all in anticipation of the wedding she would one day celebrate. So the practices found on Pinterest aren’t brand new. They’re just more public. I suppose so it goes in this increasingly public age – but this, I think, is where my discomfort lies. One woman’s willingness to make public her private wedding dreams allows too easily for the perpetuation of the stereotype that this is what all women are doing (or want to be doing). Aside from the tried and true critiques we might make about overeager wedding pinners (they validate the power of what many critics call the “wedding-industrial complex”; they reveal the material undercurrent that marks so many elements of American life and culture; they contribute to the normalization and acceptance of narcissism; etc. ), my biggest problem with the pinning going on here is how it further standardizes and entrenches the gendered division of unpaid labor in American life and romantic relationships for all women – even those without the time or inclination to imagine a fictive celebration. Planning a wedding (a real wedding, not a Pinterest dream wedding) takes time – which can manifest as time away from work, family, friends, fitness, hobbies, you name it. And it is work. It falls into that category of unpaid labor that is often celebrated for continuing rituals, maintaining tradition, fostering family ties, and by which women are often judged, but is work that is virtually never rewarded or respected in the way any kind of paid labor very clearly is (see “paid” descriptor). What’s more, when it’s a labor assumed to be universally enjoyed by women, women can find themselves alone in completing it or condemned for not being enthralled with it. If Pinners are willing to see their visions through and take on labor of this kind (and, I suppose, are “lucky” enough to find partners who stay out of their way), that’s fine. But the possibility that all women might be expected to do the same – and might be viewed as a single monolithic bloc – is more troubling.